I was poking around my computer and found a forgotten recipe. I’m not sure why, pharm but I never got around to posting this Bacon, Black Bean and Poblano Pepper Chowder. It would have been a shame to never post this, so here it is. This soup was smoky, a little spicy and very flavorful. Top it off with some sliced avocado, radishes and cilantro and you’ve got yourself a meal. I’d also serve some nice, hot tortilla chips alongside for a little bit of crunch. To make this vegetarian, simply omit the bacon. Set a large pot over medium-high heat and add the bacon bits. Cook them until the fat is rendered and they are nice and crisp, then remove the bacon to a plate with a slotted spoon. Add the onions and saute for 5 – 7 minutes, or until soft. Add the garlic and saute for another minute, then add the poblano peppers, stock, black beans and tomato paste. Bring to a slow simmer, then reduce the heat to medium-low, cover and let cook for 15 minutes. Using an immersion blender, pulse the soup until all big pepper pieces are gone. Return the pot to the heat and stir in the corn and hot sauce. Cook for another 5 minutes or so, then stir in the lime juice and salt to taste. Stir in the bacon. Ladel the soup into bowl and top with avocado slices, radish slices and cilantro leaves. *To grill the peppers, just place them on your grill (whole) over medium-high heat. Turn them every few minutes and remove them once they’re slightly charred on the outside. You may place them in a paper bag and remove the skins if you prefer, but I leave mine on. If you don’t want to grill, roast the peppers using an oven recipe like this one. This looks delicious! I’d find radish a little too earthy tasting tho, anything else you’d suggest that I could substitute for it? This sounds like one of those incredible recipes I have to make, and then reluctantly admit was not one of my own. Can’t wait to try it! Cool! Bacon in any soup is fantastic! Nice recipe. Gorgeous photo! I love all the colors, especially the green avocado slices against the deep brown chowder. I’m cutting and pasting this one. 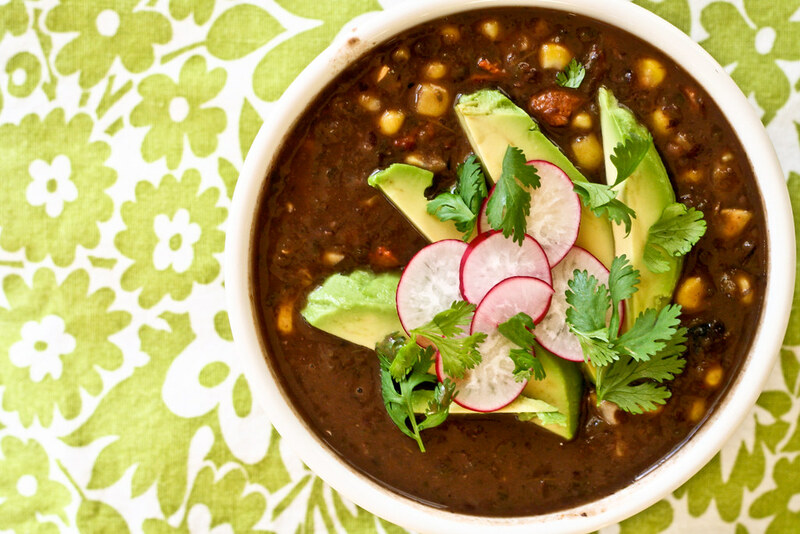 Black bean is one of my favorite types of soup! I’ve never made it with poblanos, though. Sounds really tasty! This was a delicious chowder, one to add to our favorites. We try a lot of recipes so it has to be good to make our “will do again and again”. We used 1 teaspoon of Tabasco Chipotle for the hot sauce. We found it added a sweet and warm note. Chopping the radish added crunch. We also added chopped tomato for cool sweetness, along with the avocado and cilantro. We made this early in the day and let it rest in the refriderator until dinner, then reheated, we think this helped build on the flavors. Thank you for this lovely recipe, tonight we are trying the chicken kebabs! Sounds good, but for further reference, you should really specify “COOKED” back beans in the ingredient list. Otherwise, you would end up with a crunchy soup if indeed you could actually puree it!